The Polish Quarterly of International Affairs jest anglojęzycznym kwartalnikiem Polskiego Instytutu Spraw Międzynarodowych poruszającym kwestie Europy Środkowej i Wschodniej. Poprzez publikowane w nim artykuły dotyczące współczesnych wydarzeń, stanowi forum do analiz i debat na temat spraw międzynarodowych. Każde wydanie zawiera zbiór autorskich artykułów poddanych ocenie „peer review”, a także recenzje książek. 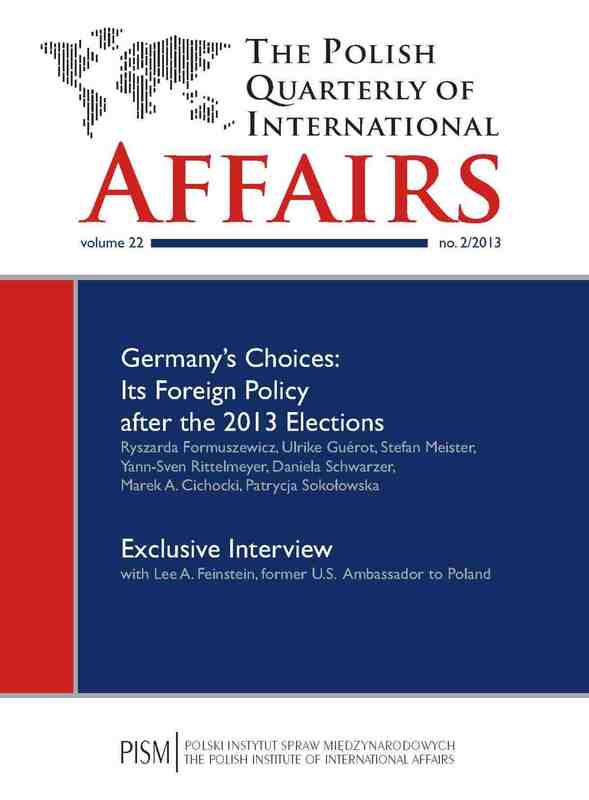 The Polish Quarterly of International Affairs is the English language journal and has a Central and Eastern European focus. It provides a forum for the analysis and debate of international affairs through a collection of original, peer reviewed articles on a contemporary theme. The election of the 18th German Bundestag has attracted more international interest than ever. Virtually no previous German parliamentary election has been watched in Europe like this one. Merkel’s European and Foreign Policy Legacy on the Eve of the German Elections: European Hegemon or Global Player? It is not easy to judge German Chancellor Angela Merkel’s European and foreign policy, as the picture is varied after nearly eight years in power. Outside of Germany, Merkel has been consistently and repeatedly blamed for a “too little too late” attitude during the euro crisis and for her tough course of austerity, especially by the Anglo-Saxon press and in Southern European countries. In Germany, however, a large number of people, 70%, approve of her crisis management and admire her for guiding Germany with a tranquil hand quite well through the crisis. Germany’s Russia policy is in flux. In the past, Germany has always been an advocate of Russian interests in the European Union and a strategic partner in energy and economic cooperation. Over the last few years, though, we have observed increasing misunderstandings in bilateral relations, with both sides speaking about the same topics but having different priorities and interests. Due not only to its importance but also to the place it leaves to symbolic politics, the Franco-German relationship is often described through emotions and in a Manichaean way, alternating between a description of two close friends and a nearly divorced couple. What is the current state of the Franco-German relationship regarding its old history and what are the new factors determining it? To what extent has the window of opportunity constituted by the Élysée Treaty been affected by the national and European contexts? What are its perspectives? Three years into the new debate on Germany in Europe, many questions remain to be settled. This article seeks to contribute to this ongoing reflection by first discussing Germany’s approaches to the management of the sovereign debt crisis and to governance reform in the euro area in order to highlight the underlying strategy, its preferences and the driving forces behind them. Second, it seeks to demystify the debate on Germany’s hegemonic strength in Europe by investigating its evolving power base. Finally, the article gives an outlook on possible upcoming challenges that German and European leaders will be facing with regard to European integration. The policies pursued by Berlin have been increasingly focused on the Baltic Sea region, particularly in recent years. The reasons underlying such a state of affairs include the obvious interests of the Baltic coast, northern Länder of the Federal Republic—Schleswig-Holstein, Mecklenburg and Hamburg—whose role and importance in the formation of pan-German policies have been clearly growing since the reunification of Germany. This has been clearly demonstrated by the involvement of the federal government to the benefit of the shipyard industry, development of port and transport infrastructure, as well as a comprehensive approach to social and economic development of the German coast along the Baltic. One is forced to wonder about Germany’s current motives and its future involvement in the Western Balkan under Chancellor Angela Merkel’s leadership. In this context, the article aims to analyse the instruments of German involvement in the region under the government of the Grand Coalition of CDU/CSU-SPD and the CDU/CSU-FDP coalition of 2005–2013.